The FIA’s Class 1 of touring cars was a category that was doomed to suffer an abrupt extinction in the short term. Not just due the money-pump business model it was surrounded by. Class 1 DTM/ITC was hands down what F1 wanted to be in its wet dreams. 2,5-litre V6 engines, RWD or 4WD, traction control, anti-lock brakes, electronic differentials and unrestricted aerodynamics, carbon body parts, virtually retaining a stock engine block only from the line-up as the only production derivative part - from time to time. All these things would make Formula 1 run for their money even today, turning these “tin-tops” into one of the most iconic silhouette racing cars ever. The Deutsche Tourenwagen Meisterschaft was quick to adapt the new category as a sort of spiritual successor to the phased out Deutsche Rennsport Meisterschaft, which was a GT-racing series running the last iteration of Group 5 cars until the early 1980’s that was practically replaced by DTM after its subsequent demise. Alongside Class 1, Class 2 was also created, which was later become known as the Super Touring category, adopted by the British, the German and other touring car championships as well - the one that would eventually and inevitably replace the Class 1 cars in DTM. It was a combination of various factors that put Class 1 out of business, but the most significant one was the concept itself with its ‘anything goes’ attitude that conclusively and inherently shoots costs into the stratosphere, regardless of racing series. Nevertheless, the money and determination put into these cars created machines that - in many respects - were way ahead of their time and would still make a cracking impression under competitive circumstances. Class 1 came into force in 1993 and went out with a financial bang in 1996. Those four years spawned five cars, of which four were raced eventually. The car that was built and tested but was never raced. Reportedly it produced 390 horsepower and revved up to 10.5k - impressive numbers on their own right, but couldn’t match its potential competitors. Reportedly, they opted to go with a straight-6 engine configuration BMW was hoping to adapt, too, but was rejected by the FIA and chose to compete in Class 2 instead. The Alfa was one of the two Class 1 cars that were introduced from 1993, but virtually raced on its own for all but one race. 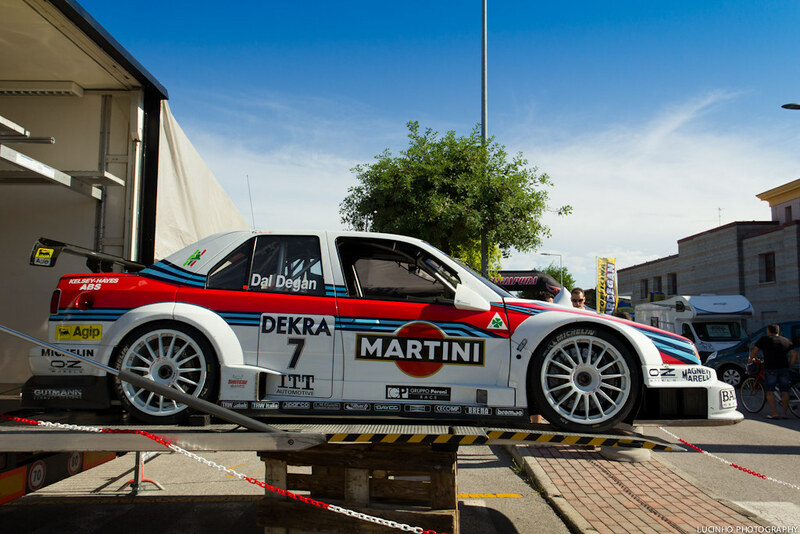 It featured all-wheel drive, not unlike its highest-scaled road-going version the Q4, which was practically a Lancia Delta Integrale adapted into a restyled body of a Fiat Tempra. The DTM car’s 60-degree V6 produced 480 horsepower while weighing slightly over a metric tonne. Won half the races it entered the first season - winning the championship, battling with its only rival in the game. Its drivers included Alessandro Nannini, Nicola Larini, Andy Wallace, Michele Alboreto, Christian Danner, Giancarlo Fisichella, Gabriele Tarquini and even Markku Alén. Fielding two cars for the last two races of 1993 by Joest racing - who are most known of their 956 Group C program in the 80s and the Audi LMP1 one currently - followed by an additional one for the following year - the Opel DTM venture didn’t prove to be a success in the beginning. Despite having such superstars as Keke Rosberg, Hans-Joachim Stuck or future champion Dario Franchitti, the car was outnumbered and outperformed from the start. The Cosworth-tuned, longitudinally placed engine was low on power, able to win only three races in two full seasons. Then Cosworth ditched the powerplant in favour of their purpose-built, 75-degree engine - able to rev up to 15k - and won it all for 1996 - courtesy mostly of Team Rosberg. Entered from 1994, it was the only Class 1 car with two-wheel drive. Despite having two less powered wheels it went on to win the battle against the Alfa Romeos and Opels in its first year. Then won the following one, too. Eventually it became one of the winningest car of its era, converting many DTM fans into Mercedes fans and vice versa, fielding some of the future’s superstars, such as Jan Magnussen, Ricardo Zonta, Juan-Pablo Montoya, Alexander Wurz, They pioneered a modular car-building structure that would determine sportscar racing until this day with its detachable front and rear end - a feature that enabled inter-race engine swaps under 5 (five!) minutes. The concept went viral and was first adopted by Audi for their highly successful LMP1 program in case they had to repair some more serious damage during the 24-hour race at Le Mans. From 1995, the face of touring car racing changed in Europe with the creation of the International Touring Car Series (which was renamed the International Touring Car Championship for 1996). The ITC marked Class 1 races that were held outside Germany - going to France, Italy, Finland, Portugal and even overseas to Brazil and Japan alongside the classic tracks of the AVUS, the Hockenheimring, the Nürburgring or the Norisring among many others. With Mercedes-Benz found to be impossible to outperform due to their seemingly infinite resources, driving the costs over the ones of Formula 1 cars, Alfa Romeo and Opel chose to withdraw at the end of 1996, leaving Class 1 dead for good, killing ITC and DTM with it. Class 2 STW took over with DTM being restored as the Deutsche Touring Masters from 2000. This brief and yet superbly fantastic era of DTM was eternally immortalized by the classic arcade game, SEGA Touring Car Championship, unknowingly acting as a prophet of the future. The game features a Toyota Supra from the Japanese JGTC series (currently Super GT) as if they belonged in one series. Accidentally, the regulations of DTM and Super GT has being unified that is to be completed in 2017 to potentially create a common series as well.